How does Wine Enthusiast 6-bottle wine cooler works. ‘Moving on’ with times, wine enthusiast 6 bottle, has created quite a buzz among wine-lovers, with its innovative design and advanced technology. The brain child of Wine Enthusiast, this compact 6-bottle wine cooler has won accolades globally, in the last few years. Wine Enthusiast had manufactured and launched this mini cooler catering to the demand of people with limited spaces at home. With compact size and light-weight, it is an easy to move, wine cooler . 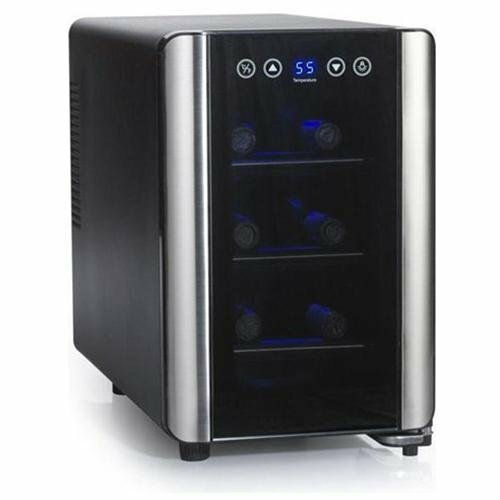 This 6-Bottle Touch screen Wine cooler has got positive reviews from critics and users on Amazon and other review sites.With high ratings, this wine cooler from Wine Enthusiast has earned its name and top position in its niche. Compact Design: You can now earn your leisure moments with your favorite wine, from one of the amazing mini coolers, disguised as mobile bar. Wine Enthusiast’s 6 bottle touchscreen wine cooler is a freestanding countertop model fitted with smoked thermo pane glass door. The trimming on the door has been made with stainless steel which further enhances the looks of this astonishing wine cooler. Handles are ergonomically designed to give you a comfortable and easy grip. Touchscreen Display: The control buttons provided on the temperature controller are given as a touch screen. The digital display to flash inside temperature of the cabinet, eases the readability and enhances the appearance. Silent Cooling: The thermo-electric technology ensures noise-free undisturbed working of the cooler. This 6-bottle wine-cooler from Wine Enthusiast is also environment- friendly which is emphasized by the fact that this wine cooler is CFC-free certified product. Removable Shelves: Six standard sized bottles can be easily stashed on the trays. If you want to keep bigger sized bottles, you can make up the space by detaching the shelves inside the cabinet, to create space according to your requirements. Cabinet Lighting: The beauty of Wine Enthusiast’s 6 bottle wine cooler lies in the way the LED lighting has been crafted in the cabinet. LEDs are blue in color and the way it gets reflected, it produces an eye-catching soothing view. The way this cooler has been artistically designed,it is a great asset suitable for various functions and purposes. A few of them are mentioned here. This wine-cooler is perfectly suitable to those who have limited space in their home. Being light in weight and compact in size, it can fit into any nook or corner of your house. For those of you who love to organize frequent picnics or outings, this wine-cooler is indispensable. Being compact and modular in style, wine Enthusiast’s 6-bottle touchscreen wine cooler is a on of the best gifting options. Wine Enthusiast 6-bottle free standing wine cooler is compact so it occupies less space in your packed home, but it adds a touch of elegance with its stunning looks. It actually adds up to the overall presentation of your home. It cools the wine bottles to give you the same sparkling flavor always. And when your wine bottles are stacked in their dedicated cooler, you will have a lot of space in your cooler for keeping other important dishes and deserts. Fast cooling capability will help you in organizing those last-moment-planned get-togethers. This wine cooler works on the principle of thermo electric cooling which uses solid-state heat pumps. Ceramic substrate is used to control the pumping of heat. Since the working of thermo-electric heat pumps depends on the ambient temperature, the area around the cooler should neither be too hot or too cold. Since thermo-electric technology does not involve the use of a compressor, any kind of vibration is straightway ruled out. There is also a provision of a water-box at the bottom of cooler to drain away any water collected due to evaporation. 87% of customers have rated it with 4-5 stars. Here is our recommendation for this stunning wine cooler. To set the desired temperatures, up and down buttons are to be used on touch screen panel.The inner LED light can be turned off or On with the help of a light button given on panel. Proper electrical grounding should be given to cooler and the wire-chord should not be exposed and rather secured behind the cooler to prevent any shocks. It is better to prevent than to repent later. The wine cooler should be cleaned on a quarterly basis. Remove all the bottles and unplug the electrical connection. Wipe inside of the cabinet with warm water mixed with baking soda .The exteriors should also be cleaned with water and a detergent powder. The electrical connections should be checked for any loose connection. Keep a minimum distance of 5inches between the rear side cooler and adjoining wall since heat is pumped out from the rear side. Before powering on , keep the cooler in standing position for at least 2 hours in upright position for stabilization of cooling system. If you have a close friend who is also a wine-lover, then get this cooler for him this Christmas. He will be more than happy with this wonderful gift. This cooler is hassle free if you have to consider its installation and setup procedure. The automatic temperature setting for red wine at 55 degrees makes it an ideal appliance for any small celebration. Get this compact, fast cooling and stylish looking wine cooler and you will always be praised for having such a great choice and taste. At an affordable price, you will hardly get a better deal in your hard earned money. If you are not satisfied with this product, you can click Sunpentown WC-20TL Scan Tool Review to read more info.